There is a concealed cost to the water flowing from our taps water, and that is the energy needed to treat and pump our water from the source reservoir directly to our taps. As the price of electricity increases, consumer prices are also on the rise. The Hydro-BPT project aimed to look at the efficiency of water supply and the potential for micro-hydropower (MHP) installations by the water industry. Since 2011, the Hydro-BPT project has focused on identifying and overcoming the challenges, whether technical, economic, environmental or organisational, to implementing MHP in water and wastewater infrastructure. Simply put, we aimed to identify the best technology, how much its costs, the environmental impacts and who must work together to make MHP a success. 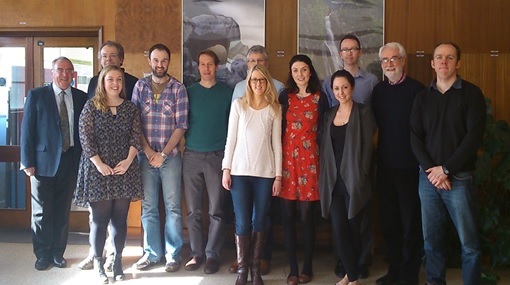 The €1 million ERDF Ireland-Wales Programme (INTERREG IV) funded project was made up of researchers from Bangor University and Trinity College Dublin in Ireland. The multi-disciplinary research team engaged with water companies and other organisations to answer the questions posed by the challenges facing MHP technology. The support or the water industry, as they try to control the price of water and reduce their carbon emissions, was evident in their involvement and in the production of their future development programmes. Therefore, the work by the Hydro-BPT team has fed into, and provided evidence, for the inclusion of MHP in strategic plans for the future of the water industry. The project comes to an end this month (June 2015). 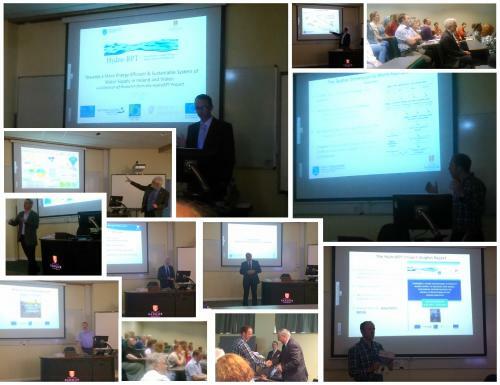 The team helped inform water companies in Wales and Ireland of these micro-opportunities and how they might implement these projects. Not only this, but the project has demonstrated its impact on the future sustainability of water supply, which links to water prices, on a national scale. At the launch of the teams Project Insights Report and public talk at Bangor University, the work completed by the project team was presented. 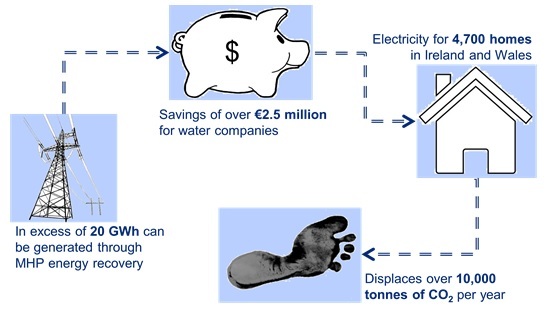 In both countries, the project identified the potential to generate 20 GWh, which equates to savings for the water companies of approximately €2.5 (£1.9) million annually. This requires significant investment, but in the long term it can help control the increasing cost of water supply for consumers. The project has drawn considerable interest from across the world, and with that demonstrates its potential for replication on a global scale. Future development projects are being planned both at a regional level in Ireland and Wales, but also on a European scale. The water industry is demonstrating an awareness of energy efficiency, and the work of the Hydro-BPT team can help them achieve a more sustainable future. For more information visit www.hydro-bpt.eu or contact us directly via email (found in the contact section) of the website.